Welcome to another edition of BEST interviews. Today you will get to know more about Ruth Bleakley. 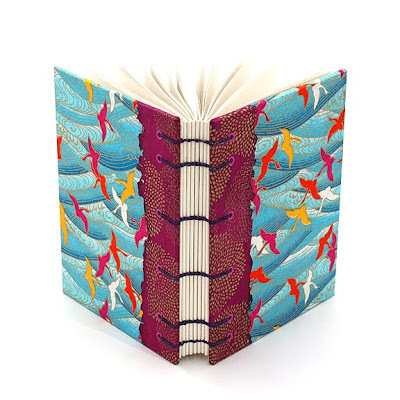 In her Etsy shop she sells her blank journals, big and small, as well as small books filled with her illustrations and pictures. She has a second shop under the name Concertina Press where she sells nautical wedding invitations and personalized stationary. Hi Ruth, nice to meet you! Tell us, where do you work and live? I live in a small coastal town in Massachusetts. Sometimes it feels tough to live outside of a city but I'm fortunate to have a nice craft community where I live, and Etsy is a wonderful portable community for creators of art and craft. I found the Etsy forums to be a great resource when I first began selling my crafts online in 2007 and also later in town. Have you thought about incorporating them in some way in your books? My day job is working at a wonderful little stationery shop where I design wedding stationery, personalized notes and business cards - the sad news is, the shop is closing since the owner is moving away. 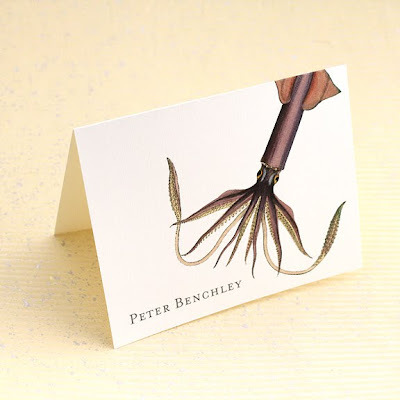 I'm taking this chance to start a custom stationery design business under the name Concertina Press. ..so if any of you folks need nice business cards - get in touch! I also teach bookbinding at a community school. - I absolutely love it! - I love the moment when people "get it" and it is so neat to see what everyone comes up with, their own styles expressed on the canvas of a book cover. I think it also is my way of creating a bookbinding community where sometimes I feel like the lone wolf. 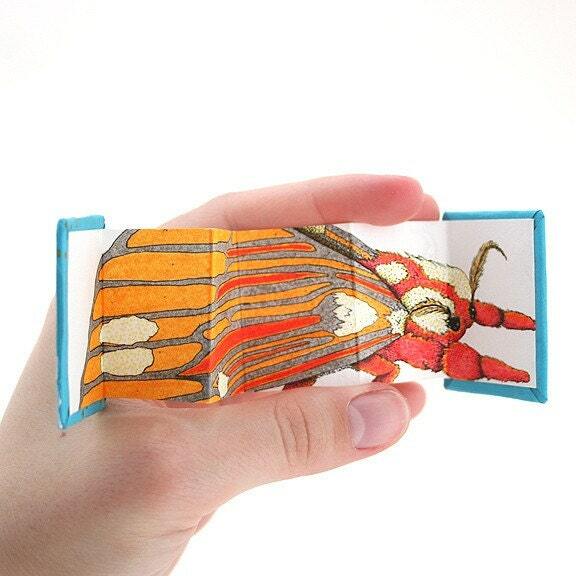 What do you call yourself, a bookbinder, a book artist? Is it difficult to decide on a label? 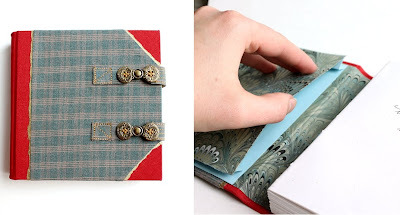 I always have difficulty deciding on a label for what I do since it seems like in general, bookbinding is such an arcane art that many people don't know what you mean when you say "book artist" or even "book binder". 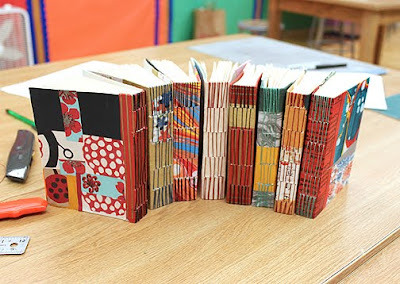 When you say you "make books, by hand" they think you mean you decorate the covers - when you further explain that you actually fold and sew the pages together with a needle and thread, then cut the covers, put on the papers and cloth then glue the whole thing together usually people are amazed! So I suppose I use the term "book artist" more often simply to distinguish that I'm not a commercial book publisher. Tell us a little more about your shop and your crafting: What do you make and sell? And is there someone who helps you with the shop? I'd describe my style as vivid, colorful and playful. 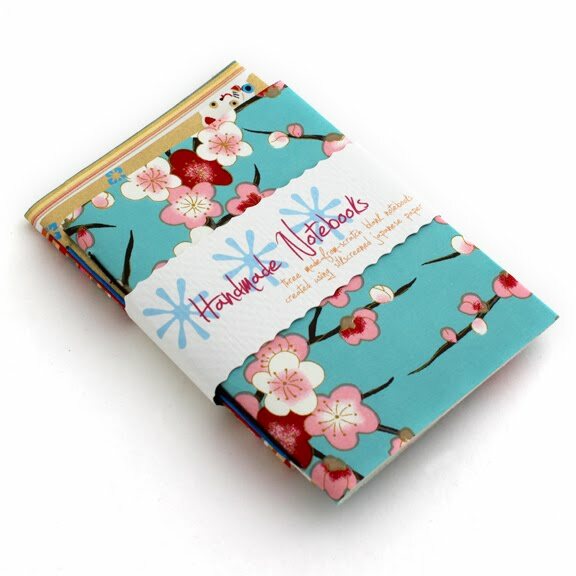 I love Japanese papers like Yuzen and Chiyogami with colorful prints. I make everything on my own, although I've been known to force visiting friends to help me do things like stack signatures or make pins or magnets. Besides journals, I also make a lot of notebook sets, and last year bought myself a 1" pinback button maker which I also use to make magnets. While my online footprint suggests that my main gig is creating miniature books, in fact I most often make larger sized books. I started with miniatures for the simple reason that supplies were a lot more affordable at a small scale and I was a poor student when I started my Etsy shop. It's funny because I've made and sold maybe 15 miniature books (and Etsy is an excellent venue for me for those) but I've created and sold hundreds of full sized journals at craft fairs and local stores. My Etsy shop is where many of my one of a kind items go that are too delicate to be sold at craft fairs, like the ever popular moth journal, a collaborative effort by my friend Christina and me, where she illustrated the moth and I decorated the covers. Please show us a book of which you think it is special. Maybe there is a book that's connected with a story? Here's a wonderful commissioned piece I made for a guy named Matt who had commissioned many books from me for his friends over the years, until finally his partner said "you know what, it's time Matt gets a book of his own, he loves your work" - but her challenge was that Matt had just consigned one of his all - time favorite pairs of pants to the rag pile, would it be possible for me to incorporate them into a book? I used them to make book cloth and created a charming square shaped travel journal with hand-sewn vintage brass buckles (I thought they complimented the pants nicely), hand marbled endpaper that I made, a secret pocket, a unique exposed binding inside the book - I went all out because Matt had commissioned me to make many books over the years, I wanted him to have some of my nicest work. I've been adding some marbled paper to my Etsy shop, a continuation of my bright and colorful style - while you can find plenty of gorgeous handmade marbled papers on Etsy, I've yet to find many in the bright colors that I love, so I've started making my own. Outside of Etsy I'm experiencing a turning point in my life where I've decided I want to make my art and craft my main focus, priority and (hopefully!) source of income. I've already put together a line of journals and notebooks to be wholesaled and some of the items I sell at my Concertina Press Etsy shop. If you know of any cute stationery or book shops in your area I'd love for you to give me the contact info so I can send along a catalog. I'm crossing my fingers that 2011 will be the year I get established in more brick and mortar shops across the US. And finally: Do you have a favorite book about books, one that you would recommend? While it's not exactly about books, but about a companion craft, The Ultimate Marbling Handbook by Diane Maurer-Mathison is my go-to guide for all marbling patterns - unfortunately it's out of print, but my husband won husband-of-the-year-award by acquiring a copy for my birthday last year. I really love your work, Ruth! For our one-year wedding anniversary last year, where paper is the traditional gift, my husband bought one of your mini books with the jellyfish drawing for me. Tus trabajos de cartonajes son magnifico.Felicidades.